Patients with enlarged prostates who are prescribed drugs called 5-alpha-reductase inhibitors are around a third more at risk of the condition. They reduce the production of androgens, a hormone which help to boost urinary flow, a common problem among men with enlarged prostates. But these drugs – which include finasteride and dutasteride – may slow metabolism and reduce the body’s insulin sensitivity, which can trigger type 2 diabetes. Finasteride made headlines in 2017 when Donald Trump’s doctor Harold Bornstein revealed the President takes the controversial drug to combat baldness. The research was carried out by the University of Edinburgh and University College London. It was led by Professor Ruth Andrew, a personal chair of pharmaceutical endocrinology at Edinburgh. ‘We found that commonly prescribed medications for prostate disease can increase risk of type 2 diabetes,’ Professor Andrew said. More than three million prescriptions of finasteride are issued every year by the NHS in England – and many more are bought privately. In the US, about eight million a year take it for prostate issues and 1.2million for hair loss. The 5-alpha-reductase inhibitors are often prescribed to treat benign prostatic hyperplasia (BPH), the medical term for an enlarged prostate. This becomes more common with age, with an estimated prevalence of between eight and 60 per cent in men aged 90. To determine the health effects of the drug, the researchers analysed the health records of 55,275 men in the UK who had been prescribed 5-alpha-reductase inhibitors for their BPH over 11 years. Results – published in the British Medical Journal – revealed the drugs raise a man’s risk of developing type 2 diabetes by around one-third. Finasteride was originally developed to treat urinary problems in men, but during trials scientists found an unexpected side effect – hair growth. In 1997, the FDA approved the steroid inhibitor as the first ever drug to treat male pattern baldness. Taken once a day, the drug is mainly sold under the brand name Propecia. Millions of American adults use the pills, which are proven to be 90 per cent effective. It is unsure how many men in the UK use it as it is a prescription-only treatment that isn’t available on the NHS. But Asda are able to sell the drug without prescription as it will be available through a pharmacist-led patient group direction. This means patients have to be seen by a pharmacist before being given the drug. Among the reported side effects that come with taking the drug, which can often takes months to work, is a loss of libido and erectile problems. The drug has come under increasing scrutiny in recent years by regulators in the United States and Canada because of a possible link to mental health issues. And research of men over the age of 66 published in March provided the first concrete evidence of its risks to depression and self-harm. Western University scientists found men using the drug, known as an 5ARIs, had an 88 per cent higher risk of harming themselves. Their risk of depression was 94 per cent higher. The drug works by reducing the level of a hormone called dihydrotestosterone which can damage hair follicles. This is also how it makes prostate glands smaller. This means that in a group of 500 men who are taking the medication for 20 years, 16 cases of type 2 diabetes are likely to develop in people who would otherwise not have the condition. A similar effect was seen when the team repeated the study with the health records of 91,681 Taiwanese men. ‘By studying real word data from different ethnic populations across the UK and Taiwan, we found that men being treated with dutasteride or finasteride for BPH have a roughly 30 per cent increased risk of developing diabetes,’ Dr Wei said. The findings suggest men taking these medications may require additional health checks to monitor warning signs of diabetes, such as unexplained weight loss, extreme thirst and fatigue. ‘These findings will be particularly important for health screening in older men who are already typically at a higher risk of type 2 diabetes,’ Professor Andrew said. If these symptoms occur, the men’s prescriptions may need to be altered, the researchers claim. They stress, however, patients taking these drugs should continue to do so as prescribed. And they added treatment guidelines do not need to change based on their study. Dr Wei, added, however: ‘It is important that all patients are made aware of the risks and benefits of their medications. Professor Andrew claims the researchers will continue to study patients taking these drugs to help them better understand who is most at risk. Mr Laurence Stewart, a consultant urologist at Spire Murrayfield Hospital and honorary consultant at NHS Lothian – who was not directly involved in the study – said: ‘These findings should not be a major concern for men taking 5-alpha-reductase inhibitor medications. ‘As doctors, we may need to review the way we monitor our patients to make sure we are extra vigilant for early signs of diabetes. 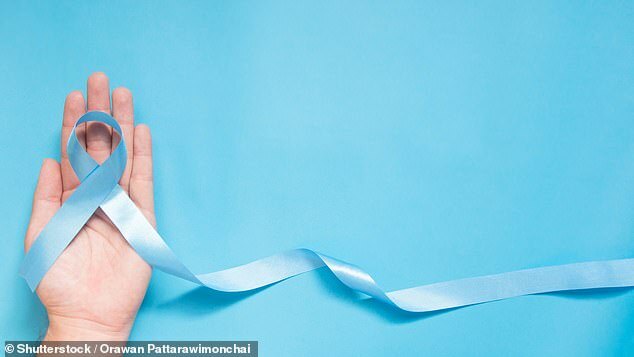 Research suggests finasteride triggers hair growth in up to 80 per cent of men, but one in 60 then experience impotence – and the risks increase the longer they are on the drug.